Yafo (known as Jaffa in English and Yaffa in Arabic) is an ancient city thought to be one of the oldest in the world. Much discussion has revolved around after whom the city is named, with some linking it to Noah’s son Japheth and others associating it with Cassiopeia, Andromeda’s mother in Greek mythology. Yafo is historically, culturally and anthropologically rich, and offers a wealth of things to do and experience. One could easily devote several days to visiting its numerous landmarks, winding side streets, historic attractions, beautifully restored old neighborhoods, bustling flea market and arts venues. The old city is choc-a-block with notable sites, including the Clock Tower, Andromeda Rock, the Zodiac Alleys, Kedumim Square, Mahmoudia Mosque, St. Peter’s Church and the Libyan Synagogue. Most of these are clustered together, making it easy to see them in a leisurely half-day of exploring. Ancient Yafo has an extensive history that includes multiple conquests and cycles of destruction and reconstruction. It is mentioned in both the Hebrew and Christian Bibles, and was the site through which King Solomon imported cedars from Tyre to build the First Temple. The Arabs conquered the city in 636 C.E. and the Crusaders invaded five centuries later. Yafo was later controlled by the Ottomans and Egyptian Mamluks, only to be ransacked in 1799 by Napoleon’s army and re-conquered by the Ottomans. From the mid-19th century until the British conquest in 1917, the city was a thriving commercial center, and from the late 19th century until the 1920s, Yafo served as the headquarters of the modern Zionist movement in pre-state Israel. 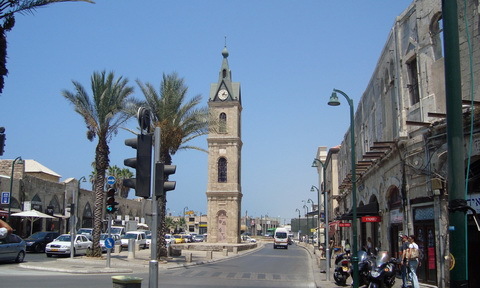 Neighboring Tel Aviv was established in 1909 as a suburb of Yafo, and the two cities officially became one in 1950. Until this day, Muslims, Jews and Christians coexist in the city. Today, parts of Yafo are undergoing something of a renaissance: A number of its older neighborhoods with majestic houses are getting makeovers, and the municipality is dramatically renovating the port and extending the Tel Aviv promenade through Yafo to connect it all the way to Bat Yam. In fact, one of the most picturesque ways to approach Yafo is by foot, along the paved beachfront boardwalk, across the pedestrian bridge that unofficially marks the place where it meets Tel Aviv—and where old meets new. Yafo and Tel Aviv can sometimes feel quite different from one another. Together, though, they create a unique fusion of Levantine, Arab, European, Jewish, modern and ancient influences.